August 22, 2010 The Captain & His Wife Are OFF on Vacation Untill September 4th. As Much fun as it is being a fishing guide , sometimes a break is good! So we will be away untill September 4th. I will answer emails as best as possible but we will be traveling a lot and may not have internet access. I still have some openings in September & October(Two of the best months to fill the cooler on Lake Calcasieu) and as the weather begins to cool the Speck and Redfish action will heat up! August 20, 2010 Mike & Debby H. Have a Big Lake Outing with their Fathers Glen and Warren. August 20, 2010 Mike & Debby H. Have a Big Lake Outing with their Fathers Glen and Warren. It’s usually the parents that bring the children but on this trip it was Mike & Debby who brought their fathers Glen and Warren to enjoy a day of Redfish action on Lake Calcasieu. Mike threw mostly spoons and Gulp to catch some nice bronze beauties but live shrimp under a cork enticed most of theseReds to the boat. Mike was on leave from Iraq and it was nice to know that a trip to Big Lake with his family was on top his list of things to do! 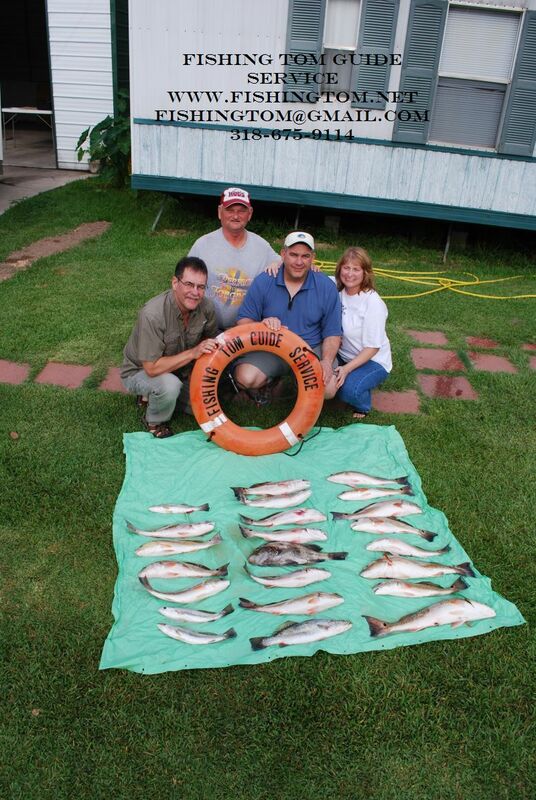 August 15, 2010 Challanging Day for Steve S. & Friends Mike & John But still Managed a Big Lake Limit!!! August 15, 2010 Challanging Day for Steve S. & Friends Mike & John But still Managed a Big Lake Limit!!! Live Shrimp under a cork and a lot of effort were the keys to this Lake Calcsieu Limit of Bronze Beauties. Also we had 4 nice Flounder to add for our efforts. August 9, 2010 Jim & Sherry H. of Alvin Tx. Have a Great Day on Lake Calcasieu !!! August 9, 2010 Jim & Sherry H. of Alvin Tx. Have a Great Day on Lake Calcasieu !!! Live Finger Mullet were the ticket for some nice Trout including a 25″ 4 1/2 pound Big Lake Beauty! 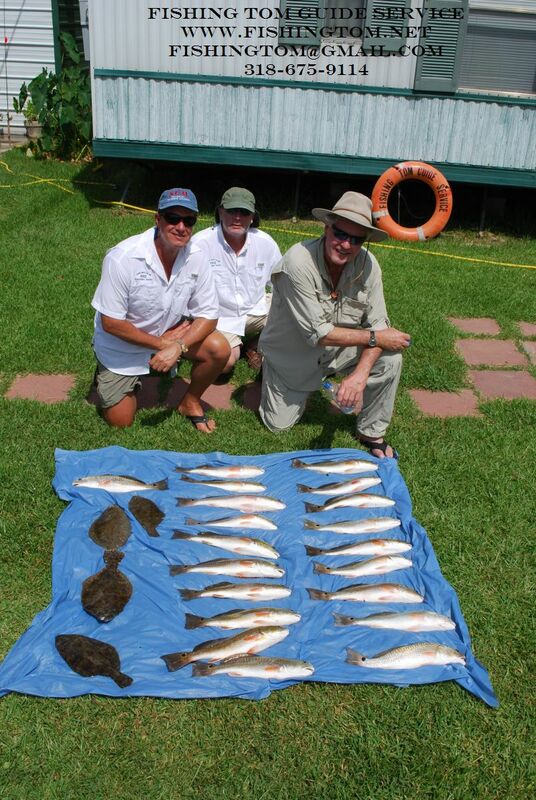 The reds took both live Shrimp and Finger Mullet for a nice limit of Bronze Beauties! August 7,2010 A Great Family Day on Lake Calcasieu and A Happy Birthday!!! August 7,2010 A Great Family Day on Lake Calcasieu and A Happy Birthday!!! 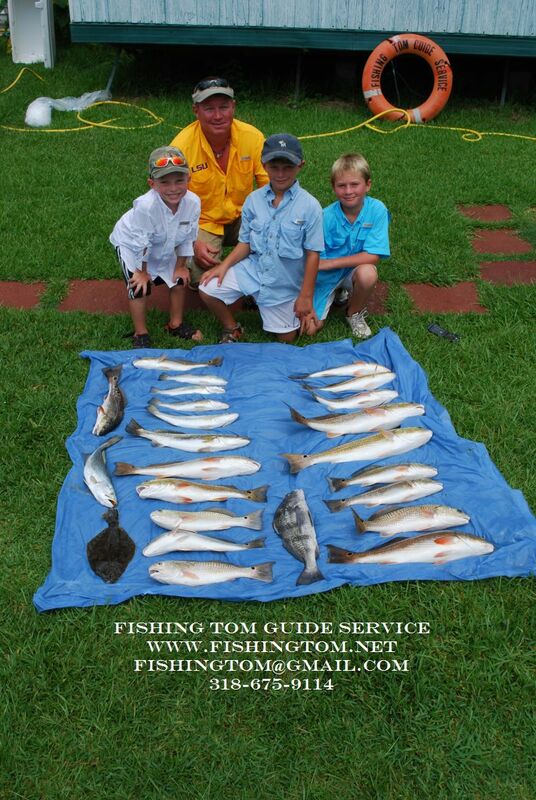 Bobby (Dad) & his 3 sons Kaleb, Cane, and the birthday boy Cooper celebrated with a Redfish Party on Big Lake! Live shrimp under a popping cork was the ticket today that kept the party going until we had a limit of Big Lake Bronze Beauties. Kaleb said he would have had a great time even if he had not caught the biggest (23 inch , 5 pounder) !!!! Happy Birthday – Cooper!!! (Who Caught the Biggest Trout(22″ 3.5 Pounder on the last cast of the day !!!! 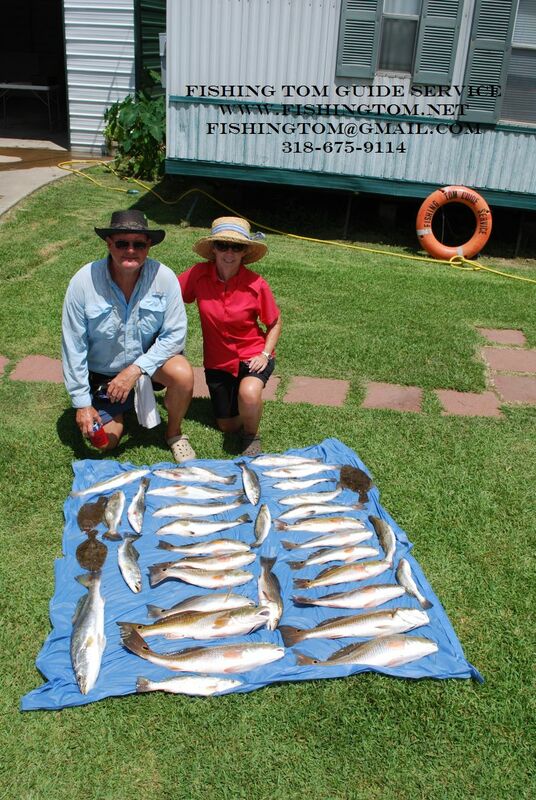 August 5, 2010 Captain & Joann With Big Lake Limit at 9 AM!!!! August 5, 2010 Captain & Joann With Big Lake Limit at 9 AM!!!! 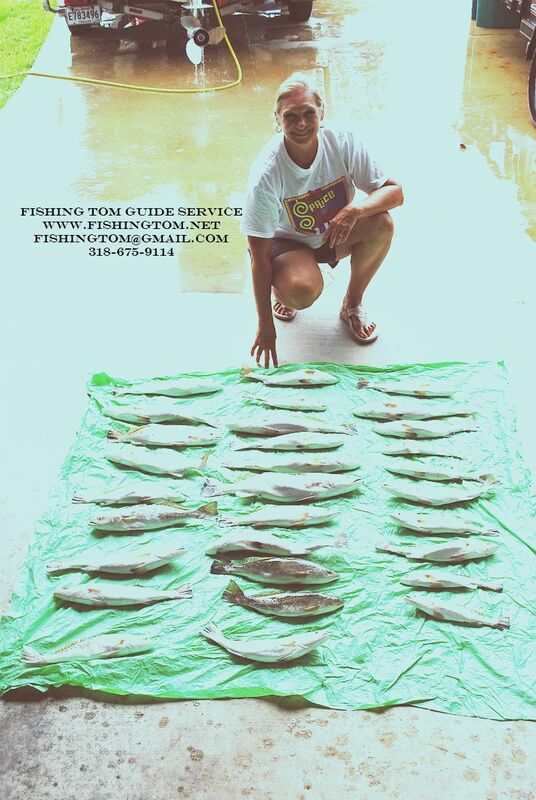 Gulp Swimming Mullet under a Cajun Thunder worked for Captain Tom, while finger mullet free lined was Joann’s choice of bait and both helped fill the cooler with a nice Lake Calcasieu Limit by 9 AM!! !